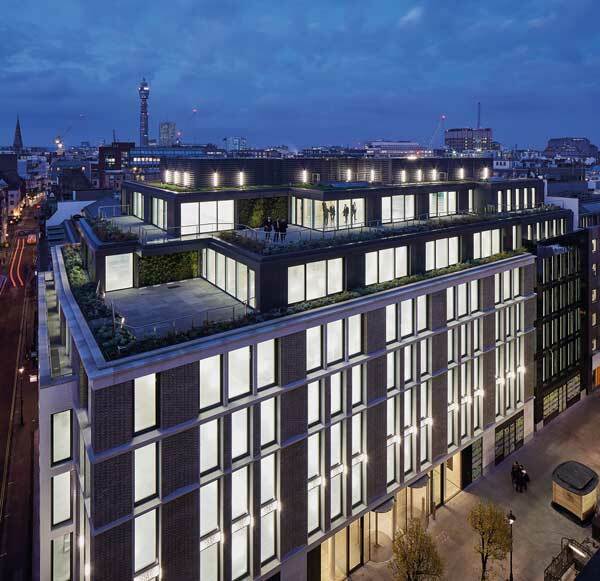 Client: Great Portland Estates plcThe structural design of Thirty Broadwick offers optimised lettable floor areas within Soho’s tight streetscape, and replaces a tired building with one that reflects the district’s modern character. The structure’s frame repeatedly steps back at upper floors and this has been achieved by using in excess of 30 fabricated transfer beams. “With this project came all of the challenges encountered when working within a busy city centre site. Logistically, great care and attention had to be given to negotiating the steelwork deliveries into site, as well as locating a 200t mobile crane on Broadwick Street to hoist in the 14t plate girder transfer members,” explains Severfield Project Director Adrian McCoy. The site originally had three different buildings that had been combined to create one office building resulting in various levels, misaligned spaces and spatial inefficiencies. Building tight against neighbouring party walls ensured that the new building maximised floor area.